In a 60 minute Turbo Tennis session, women can burn up 500 calories and men up to 800. You will run anywhere from 2.5km to 4km depending on how you play the game! The points create interval training, which means you are running those km's at your maximum. Our philosophy and direction has always been modern and fresh. We are continually looking for something more! By noticing how people enjoy and participate on our court, we have created Turbo Junior Tennis. Soon everybody will be running this way. In 2005 we were one of the first Tennis Academies to be running the 3 ball program in Australia. In 2007 Tennis Australia observed our program and was so impressed by what they saw they integrated many Turbo Tennis formats into the national HOT SHOTS program. 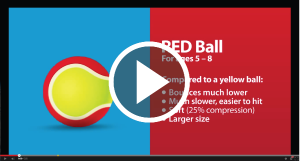 We use the 3 ball program as seen advertised on the Australian Open ANZ Tennis Hot Shots. This is Tennis Australia’s official children’ starter program for 10 and under. Watch the below videos for more detailed information on each level. Turbo Tennis sessions are high intensity points-based training. We run everything activity at maximum capacity with short recovery periods. All game play is loaded so it is at least 25% more difficult than a normal point in a match. A player on average runs 4+km per session, and it is all sprint work. At times we use the 3 balls as creates increased difficulty. The result is the player is always pushing their limits mentally & physically. Sessions are performed to music and with our unique spirit ensuring it is fun & challenging, this allows for players to strive to push themselves and grow. Technique is a high priority even though not mentioned. Soon everybody will be running this way. Purchase your new racket through us. We will make sure you end up with the right bat for you! We offer restrings and have a wide selection of strings to cater for all players. We also offer excellent service and advice on restringing and racquets.